Alright, so we have spent the last few blog posts talking about what math workshop is, using math warm ups in math workshop as an opener, and the math tools every math workshop needs. Today, we are going to talk about the nitty-gritty! We are going to talk about math workshop in action. During my math period, I start off each math session with a ten minute warm-up. This varies based on my student’s needs and my mood. Sometimes it is just a simple math stretcher (see a previous post about these here) or we practice fact fluency. Other times we may just simply review the previous day’s lesson. After our warm-up, I move into my mini-lesson. I actually pull all my students over to the easel with chart paper. The students bring their math notebooks where they take notes. I briefly go over vocabulary and concepts by modeling what to do and how to do it. Sometimes if I have time, I will walk them through it again but ask what I should do next. I will then give students a math problem to try out themselves. They will copy it down in their notebook next to the notes I placed on the anchor chart as I was teaching it. As they are trying out the problem, I peek over their notebooks and watch them try it out. If I see anyone struggling to get started or having difficulty, I write their number on my post it note. These are the students I will watch more carefully during small group and possibly target during conferring time if they are still struggling after small groups. If I’m not able to get around and see everyone work through the first problem presented, I will try to give a second and check then on those I hadn’t seen yet. Each group spent about 15 minutes in each rotation (so about 45 minutes total). After my mini-lesson, I review where students are going and what they’ll be doing. Then I send them off. I use to have a rotation chart that was pretty simple on chart paper. This year I’m not using it but instead just printed off to students where they were going during each rotation. Some groups just find all that information in the chart paper too distracting. Some students will go to the independent station where they will practice skills from the mini-lesson I just presented. Since this center focuses on the lesson I just presented, my high group will go here first. All the other students in my class attend this station AFTER they have meet with me in small groups. Usually my high flyers just need to see how to do something once or twice and they are good to go. This gives them an opportunity to get on it right away and frees up their group time for more enrichment. I do have a few rules for them if they aren’t sure of something. If there is anything they don’t know they must first try, second quietly ask a neighbor to help, and then finally circle the problem to ask about in small group. When this group comes to me later in small group, the first thing we do is check the work they did independently so I can decide if we need extra practice or if we can move on to something deeper. While some students are in the independent station, other students are working with me. During the first rotation, I always have my lowest group meet with me first. I like to make sure I get a chance to work with them right away to reinforce anything they may need or fill in any gaps to understand the lesson. I also do this because if I feel any of them need to sit in on my next rotation guided group they can. I also like to make sure they get to practice the skill right away after meeting with me (instead of a gap between learning and practicing). The final station that students have is the choice station. I like to give my students choices to give them some control and it engages them more. At the beginning of the week I provide students with a choice slip (click on the picture below to download it free!) of five different items that they have to have completed by the end of the week. They will work on it during this station. On this list, I add things that review previous concepts, such as games or practice sheets. I also include a fact fluency activity of some sort. Sometimes it will be a journal entry or hands-on activity. I have also left it open for students to write in an idea of their own. This is completely up to you. You can also download my FREE Sampler from the Multiplication and Division Math Workshop Unit to get an idea if this is a product for you. Thank you for such a detailed post – I can visualize exactly what happens in your classroom during math rotations, and I have a better understanding of what guided math "looks like". Thank you Deb! I want to continue writing more detailed posts about it. There is just so much about Math Workshop that I love! Hi! I really like how you do your math workshop. For your choices station, do you provide them with a packet each week of the different tasks they need to complete? If they are games, how do you hold them accountable for playing them? Thanks! For the choices station, I was giving them a packet every two weeks. Sometimes I would just put out different numbered bins with games in them. The only accountability that I had was to turn in the choices sheet each week for a participation grade and if they didn't do as they should during that time, they would lose the privilege and sit next to me. I monitored from afar. Do they fill out the choices sheet? When do they have to sit out? Lots of food for thought! WOW! It can be overwhelming at first- but it's similar to reading workshop. Definitely start small and work into it. Maybe even tweak it to your style. I'm going to keep adding to it later! I can see from your rotation chart that A must be your lowest group. Are B and C your two highest and D your middle? Do you go over homework problems (from the previous day) with your students? If so, when? We usually don't. We may go over something in small group with me, but other than that no. But you can always work that in if it's important to you. Workshop is flexible. Is there a way I can print all of this? Most browsers offer a way to print. It would depend on which browser you have. I'm sorry I couldn't help more. Are the students are copying your mini lesson notes in the notebook? 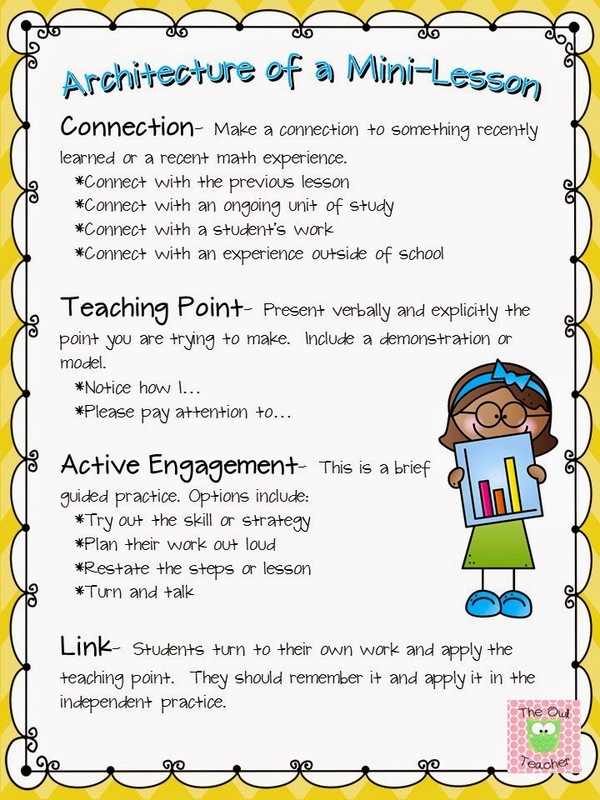 How do you deal withthe students that need extra time to write the notes? Oh yes! There are always some students who lag behind. Depending on the reason for lagging will determine how I handle it. If it's a student who just naturally moves slow, I might make copies of notes from another student's notebook and give to him/her. If it's due to wasting time, I may change his/her seat to closer to me so I can redirect him/her frequently. If I notice a pattern, I may also decide which choice can they miss without too many effects and just make sure that's what they finish doing during that choice. I hope that makes sense. I am a first year teacher trying to make my math workshop work. So far, I have been trying to have students do independent/partner work for independent practice and a small group with my low groups and an activity if they early finishers. I'm a little bored with it, and I also want a way to meet with all my students in small groups besides just my low students. I think this could be a great way for me to figure out how to do Math Workshop. How do you suggest managing choice time if I don't have too many resources as a first year teacher. Does your school use a specific textbook? We use Singapore Math. How do you determine what you are teaching in small group? I am searching for the posts for Week 1 Structure of the Math Workshop and Week 2 Learning Tools for Workshop. Can you help, please. I've found 3 and 4 but nothing with week 1 and 2 labels. In your post, you stated guided math was for 30-40 mins, but how long are each rotation within the guided math? This is super helpful! Can you please tell me what the different colord of papers with your students’ names on them on your rotation page mean, and why you use sticky notes rather than just writing the names down? I’d also love to see yoyr graphic organizers, but the link didn’t work for me. Do you have a different one?